Jeanet Almhøj: SNL51: Fairies?!!? Oh no! 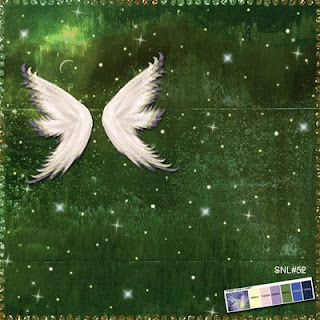 The theme for the July edition of SNL is going to be fairies and today the vote began on the colors and there seems to be a winner already so inspired by the color palette and the theme I've started working on a kit. I don't make many fantasy layouts myself so I'm expecting to have troubles with the theme. The fairy wings and the stars overlay is just about as far as my imagination will stretch right now. It's probably a good thing I've started early on this one. My thoughts exactly. You don't mess around do you - good for you getting started. I still haven't done June. sigh.